This straightforward guide introduces the newcomer to the core theoretical principles and therapeutic strategies of Rational Emotive Behaviour Therapy (REBT). Starting with the ABC model of emotion popularized by Albert Ellis from the outset when he developed his approach to CBT, the guide then shows how REBT distinguishes between unhealthy and healthy negative emotions. From there it outlines the four irrational attitudes theorized to be at the core of emotional and behavioural disturbance. Finally, the newcomer to REBT will develop an appreciation for how REBT inoculates clients against future problems and teaches them to maintain and extend their treatment gains. This Newcomer’s Guide will be a useful contribution to counsellors and psychotherapists in training, either in Rational Emotive Behaviour Therapy or another cognitive-behavioural approach. "Drs. 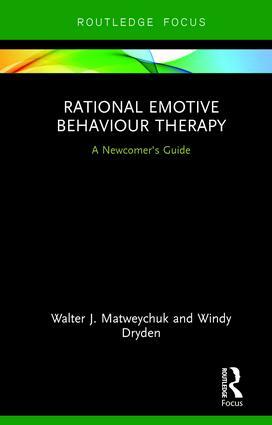 Matweychuk and Dryden have written a great book, which will not only explain the theory and principles of REBT, but will also help the reader DO REBT to help others. This is a great introduction to REBT, which will help any psychotherapist." "An elegantly tailored presentation of state-of-the-art REBT, lucid, succinct, and readily fitted to a wide range of problems in therapy and in life. Readers of other CBT literatures may be challenged and inspired by the frank philosophical approach to hardship and adversity." "This is an invaluable guide to the basic principles and strategies of Rational Emotive Behaviour Therapy (REBT). It is elegantly and clearly written as it describes, through the ABC model, how our unhelpful thoughts lead to distressing unhealthy negative emotions and unhelpful behaviour. It goes on to show how these unhelpful thoughts can be changed to enable individuals to lead constructive, happier lives. This model works well in the therapeutic or coaching arena. It is an ideal resource for trainees or those wishing to incorporate REBT into their therapeutic or coaching practices." Windy Dryden, Ph.D, is in part-time clinical and consultative practice and is an international authority on Cognitive Behaviour Therapy. He is Emeritus Professor of Psychotherapeutic Studies at Goldsmiths, University of London. He has worked in psychotherapy for more than 40 years and is the author and editor of over 215 books. Routledge Focus on Mental Health presents short books on current topics, linking in with cutting-edge research and practice.